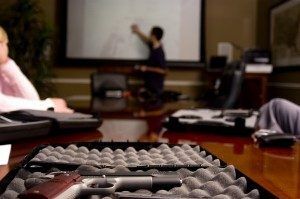 Illinois Gun Training is your top resource for Illinois Concealed Carry Permit instruction. Our instructors are certified and experienced. Browse our class schedule below. Click here to request Private Classes! Read our FAQ for answers to the more common questions. For More information for Out of State residents click here. Now teaching Illinois Concealed Carry Classes in Villa Park, & in Your Own Home! Questions About Obtaining Permits From Multiple States? Read Our Multiple Permits Guide. If you have been considering getting a Illinois Concealed Carry Permit, now is the time to act. Currently the Illinois CCW Permit is valid in 22 states and counting. Our Concealed Carry Instructors are certified by the state of Illinois. Each instructor uses a uniform curriculum that covers vital Illinois CCW info in addition to the state minimums. Learn about each instructors individual qualifications by visiting their profile pages. The cost of the class is $200 for everything.